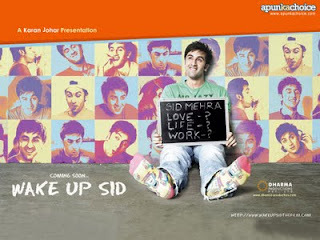 Wake Up Sid, directed by Ayan Mukherjee is a breezy 'coming of age' tale of a rich, carefree brat Sid -Siddharth Mehra. Sid (Ranbir Kapoor) as he is called by friends, is just out of college and believes in living in the moment. "Who knows where we will be tomorrow?" he declares to his friends in a short monologue. This also means he has no sense of responsibility, or any clue as to a profession or living life on his own terms. Chancing upon a older, more career-focused Aisha (Konkana Sen Sharma), new to Mumbai, he helps her find a rented abode. Things go breezy and carefree on celluloid, until the final year results arrive, and Sid discovers that he has flunked. Angry and arrogant, he leaves home after an altercation with his bath shower firm-owning father (Anupam Kher). Helpless, he moves in with Aisha. Similar growing up shades were seen in Farhan Akhtar's sparkling directorial debut Dil Chahta Hai and in his second movie Lakshya. Ayan keeps it simple, and it is the chemistry between the main characters played by Ranbhir and Konkana, the clash of their mismatched personalities that keeps the film going. Apart from characters like Sid's college friends and his parents (Anupam Kher excellent as the strict father, Supriya Pathak charming as the English-learning mother) - the Shankar-Ehsan-Loy soundtrack is the movie's strength too. Which kind of movies are popular among general public ?